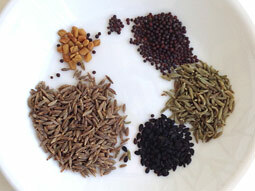 Take all spices (fenugreek seeds, mustard seeds,fennel seeds, nigella seeds and cumin seeds). Don’t add too much fenugreek seeds as it gives the bitter taste to the curry. 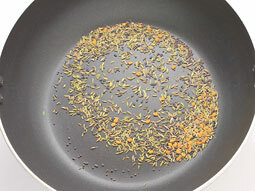 Add above mentioned spices in a pan and dry roast them together over medium flame for a minute or until nice aroma comes. Let the spices cool for few minutes. 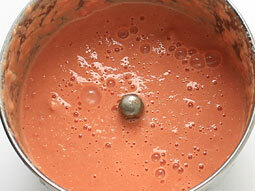 Transfer them to the small jar of a mixer grinder and grind to a medium coarse powder. 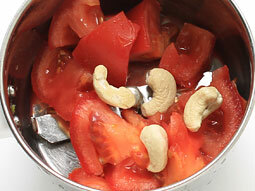 Add chopped tomato and cashewnuts in the same jar of grinder. 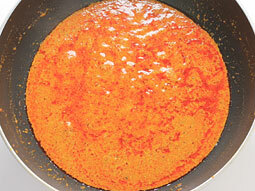 Heat oil in a pan or a kadai over medium flame. 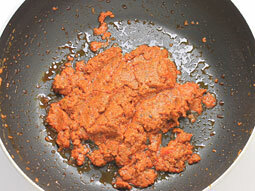 Add asafoetida and green chilli-ginger paste and sauté for approx. 30 seconds. 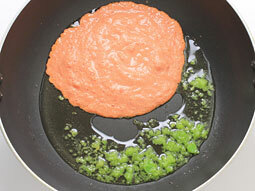 Add tomato puree. Sauté until oil starts to seperate. 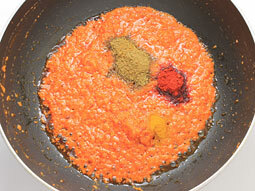 Add coriander powder, turmeric powder and red chilli powder. Mix well and cook for a minute. 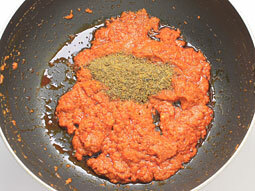 Add crushed spices powder (prepared in step-3). 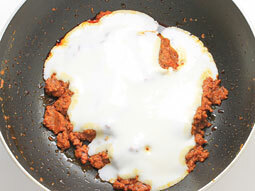 Reduce flame to low and add beaten curd. Add paneer cubes, kasuri methi and salt. Mix well and cook for 2-3 minutes. Turn off the flame. Add finely chopped coriander leaves and mix well. 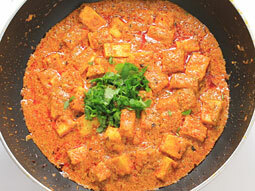 Achari paneer is ready for serving. Serve it hot with roti or paratha. If you are using frozen paneer cubes, soak them in hot water for 10 minutes to soften before using. 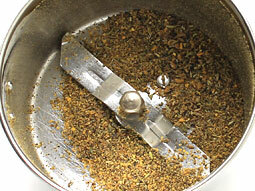 Don’t increase the amount of fenugreek seeds or mustard seeds as they may make the curry bitter. Use boiled potatoes in place of paneer for variation. Add 1 tablespoon gram flour in step-9 to prevent the curd from curdling. 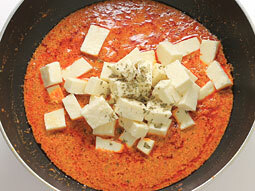 Add fresh cream in last step to make this curry more creamy. 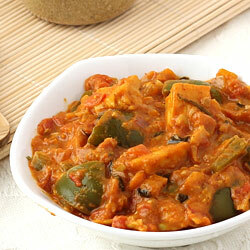 Serving Ideas: Serve it with roti or steamed rice as accompaniment or side dish or as an appetizer for a difference. 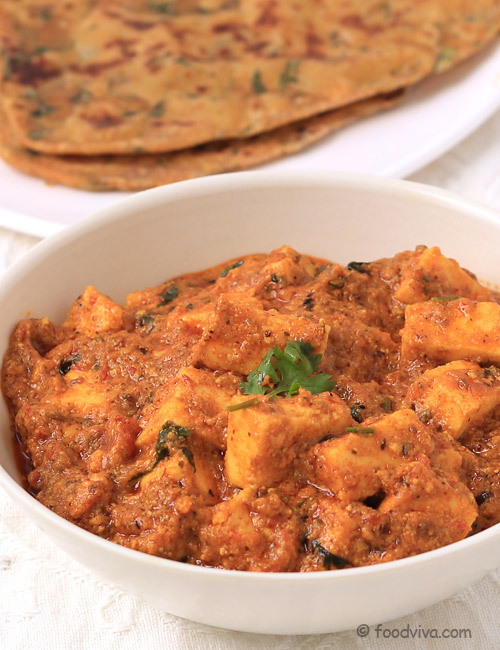 Paneer achari with semi or thick gravy can make delicious and filling wrap as well. Once again one more yummy recipe. Thanks for sharing. I never feel afraid in trying your recipe bcoz it always comes out superb. The taste was too yummy.